A place which had supplied the huge sandstone volumes required for most of Ancient Egypt’s great architectural endeavors like Karnak and Luxor, had ‘monumental’ secrets of its own. 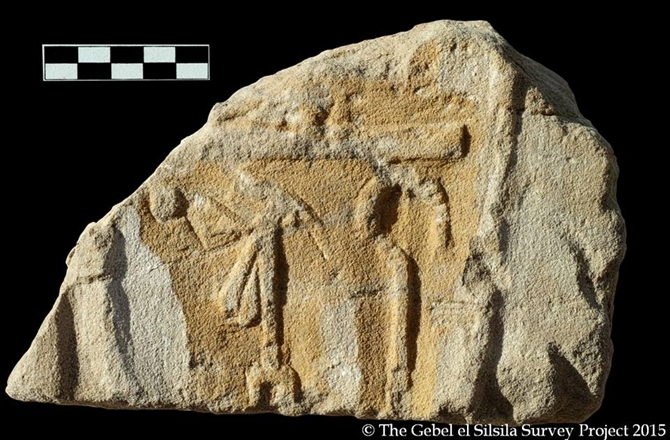 Egypt’s Minister of Antiquities had announced on 17th April the unearthing of a long forgotten temple at the famed Gebel el Silsila (also known as Kheny or ‘Rowing Place’ in Egyptian), with its location being around 65 km (40 miles) north of Aswan. The site in question was one of the incredible quarries of the ancient world, with Egyptian factions using its stone sources from the New Kingdom era (16th century BC) right till the Roman times. 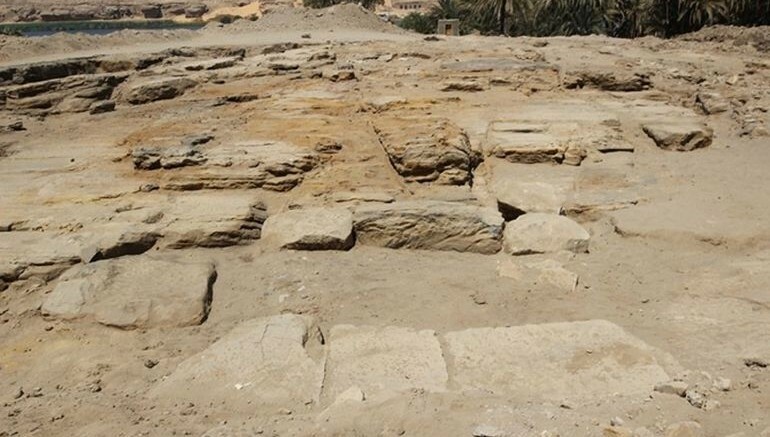 But now archaeologists have uncovered foundation ruins of a temple that pertains to a well established settlement at Kheny – thus suggesting that Gebel el Silsila was not only a much-used quarry site, but also a sacred location with dedicated religious structures. Interestingly, the first modern-day recording of such a temple’s existence was probably made by 1934, but the structure itself was long forgotten after that. However, archaeologists (from Lund University) once again started their work from 2012, with the goal of unearthing the temple ruins. Suffice it to say, they were successful – with the newly uncovered remains hinting at a substantially large foundation that is 115 ft x 60 ft (6,900 sq ft) in area. These foundations works probably supported a four-level building with column bases (as opposed to a load-bearing structure) and a double wall arrangement with outer and inner layers. And even more fascinatingly, the oldest segments of the temple were built from limestone – which is certainly antithetical considering the religious building was built on the site of a major sandstone quarry. In that regard, the temple specimen itself might suggest the shifting of focus from limestone to sandstone as the primary building material for Ancient Egyptians. 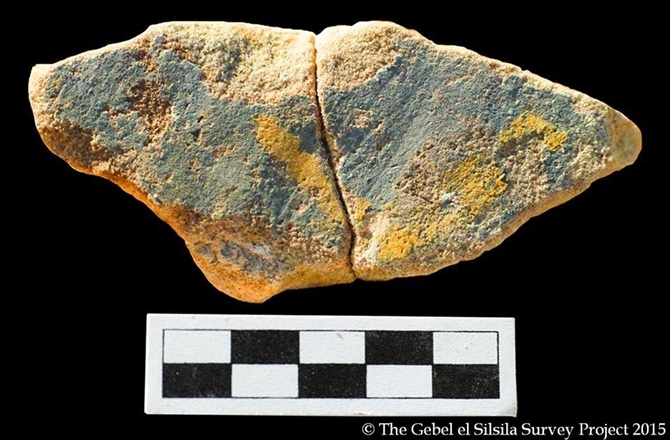 In any case, the archaeologists have been able to identify at least four chronological periods that coincide with the 1500 years lifetime of the temple’s usage pattern. 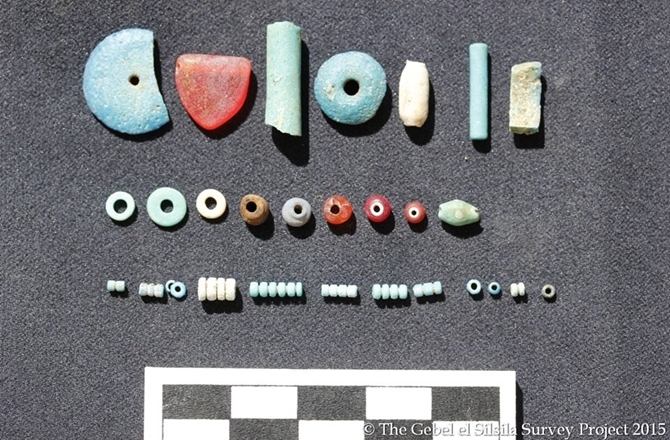 To that end, the earliest remains like beads, colored plaster, faience specimens and a blue-hued scarab pertain to 17th century BC (Second Intermediate Period). 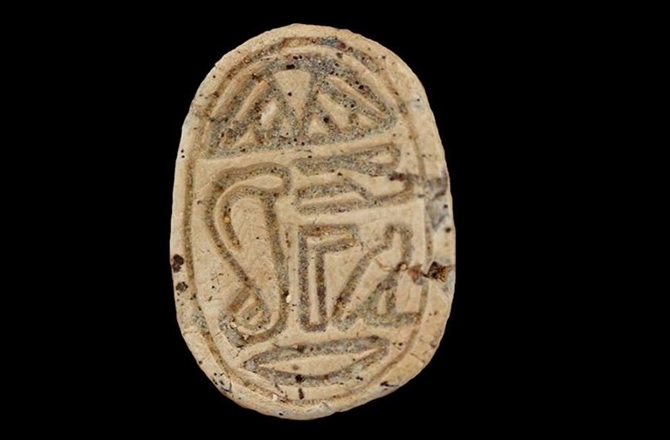 This is followed by 15th century BC dated remains, including ornamented blockworks and a hieroglyphic text that clearly mentions the site’s Egyptian name Kheny. The third chronological phase relates to numerous fragments of painted reliefs, like depictions of cartouches of two later rulers – Amenhotep III and Ramses II (from 14th to late 13th century BC). And, the last period of the temple’s usage intriguingly matches up with the much later Ptolemaic (Greek) and Roman storage facilities. We hope to continue the archaeological work on site, especially as its state of preservation is so poor and requires immediate documentation before it is too late.